After opening to the I Ching by ASKING a question, the next part of the conversation with the oracle is to connect to the divination through the chance operation of CASTING, or throwing three coins, six times to form a hexagram. The hexagram becomes the key to the reading as well as the basis for our I Ching Modern Quilt-along blocks. You might be wondering, "If the hexagram is determined by chance, then how is it relevant to me and my situation?" OR "How am I connected to the random happenings of the universe?" whoever invented the I Ching was convinced that the hexagram was the exponent of the moment in which it was cast -- even more so than the hours of the clock or the divisions of the calendar could be -- inasmuch as the hexagram was understood to be an indicator of the essential situation prevailing in the moment of its origin. This assumption involves a certain curious principle that I have termed synchronicity,a concept that formulates a point of view diametrically opposed to that of causality. Since the latter is a merely statistical truth and not absolute, it is a sort of working hypothesis of how events evolve one out of another, whereas synchronicity takes the coincidence of events in space and time as meaning something more than mere chance, namely, a peculiar interdependence of objective events among themselves as well as with the subjective (psychic) states of the observer or observers. Let me summarize: In our western mind-set we tend to think about time and events as linear. We assign meaning through causality. So when we look at our lives, we think - this happened - we were born - which in turn caused this to happen - which caused this to happen , and so on - until we die. Jung introduces synchronicity as an alternative model for understanding our relationship to events and the unfolding of time. Through synchronicity chance events, happening simultaneously in time and space, relate to each other in the shared and present moment. When there is a relationship there is meaning. Cool right! So many possibilities for creation open up from this idea. Just think of the ways you might allow random events to influence, decide, or guide your creative output. Once you've chosen your question for the I Ching, write it down. Focus on your question while throwing all three coins together. See how they land and count them up. Each head counts three; each tail counts two. Your result will be either 6,7,8 or 9. For example, head (3) + head (3) + tail (2) = 8. Repeat six times total and record your result from the bottom up. Think of the I Ching hexagram like a growing plant moving from the ground to the sky. Once you have your primary hexagram you will look it up on a chart by dividing your hexagrams into a lower and upper trigram. Your I Ching text will include a chart or you can use one of the many references online. If you throw one or more changing lines a second or relational hexagram is also created. Go ahead and write out your relational hexagram next to your primary one. You will read both hexagrams as part of your divination along with the specific changing lines of the primary hexagram. More about this next week! 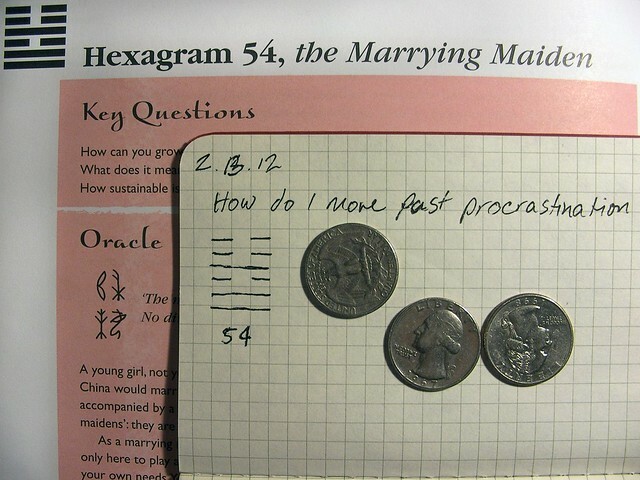 Last week I asked the I Ching about procrastination, and I threw the hexagram 54, or the Marrying Maiden. I didn't throw any changing lines. So the oracle is asking me to focus carefully on this one primary hexagram for my answer. Last week we practiced opening to the oracle of the I Ching by exploring the best ways of ASKING our creative questions. This week's task is to focus on one question and connect to the I Ching through casting your coins. If the process seems a little confusing don't worry. Once you start it will become clear. If you have a good text to work with then go ahead and look up your hexagram and see what the oracle has to say. Be sure to record all of your questions and hexagrams in your notebook. If you have questions post them in the comments. Next week we will be READING the oracle's response and integrating through resonating with the text, and journaling.